Here at Wild Birds Unlimited in Novato, we have everything needed to make sure you get a pair of binoculars that works for you. With our wide selection of models, we draw binocular shoppers throughout Marin and Sonoma counties, as well as from the broader Bay Area. One unfortunate effect of widespread internet shopping has been the frequent demise of specialty binocular shops—meaning that the urban centers of San Francisco, Oakland, and Berkeley now have shockingly few options beyond general sporting goods store with few choices and little expertise. Why do people keep coming to us? Highly competitive pricing. Most manufacturers set a minimum allowable price and we know that if you scour the internet, that's the price you'll find. So that's our price too – plus service and advice that the internet can't match. We provide the opportunity for in-hand comparisons that online shopping can’t replicate. A list of specifications is no replacement for feeling a binocular in your hand, then taking it outside and seeing birds through it. We have a wide and fine-tuned selection. We stock around 30 models from top brands like Nikon, Swarovski, Eagle Optics, Vortex, Zeiss, Celestron, Vanguard, and Opticron, with knowledge of and access to their full lines. Unlike the internet, we don’t stock every binocular in the world—we admit it—but there are a lot of binoculars out there and many of them are not worth their price tags. We stock the best models that we have found, over years of experience, at each niche of price, size, and function. See more on our selection here. We know the products. Every day of the week, you can walk into our store and talk to multiple staff members who own multiple pairs of binoculars and have used them for years. We’ll happily explain the basics of binoculars, pros and cons of different models, and make sure that you’re experiencing each pair to its full capabilities. To start your research, see our article on How to Choose Binoculars. We’re here to help you—even after you’ve made your purchase. Need a free lens cleaning and tips on bino maintenance? Stop by and we’re happy to do that. Accidentally damage your binoculars? 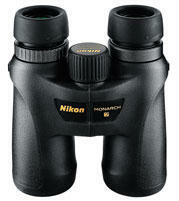 We sell binoculars that are made to last, with solid manufacturer warranties that make most typical repairs at no cost. If your bins aren’t functioning correctly, bring them in and we’ll diagnose the problem. If they need to be sent in to the manufacturer’s repair facility, we’ll package them securely, take care of the proof-of-purchase and paperwork, and cover standard shipping costs. In general, if you bought your binoculars from us and then you bring them in broken, we’ll get them back to you fixed. At no charge. Why Should I Get Binoculars? I don’t need binoculars because I’m not really a "birder". You don’t have to be! If you enjoy wildlife, scenery, hiking, or backyard birds—all those pleasures will be greatly enhanced with no need to ever place yourself under a strict label of birdwatcher. Binoculars are also an essential item to bring on any nature-oriented vacation such as an African safari, trip to Costa Rica, or cruise to Alaska. I don’t need binoculars because I like to watch close birds in my yard. Do you enjoy looking at flowers, photographs, artwork, or your friends? Do you enjoy them as much from 30 feet away? I have some binoculars already and I hardly use them—they’re not as fun as you say! There are lots of crummy bins out there, including “cheap and tiny,” “old and heavy,” and “just plain bad.” If this might apply to you, please bring your bins in to compare with some good ones—modestly priced binoculars can be lightweight and comfortable while still having bright, clear images. I am always astonished that so few hikers carry them. It’s not merely that a pair of binoculars can be extremely useful…They are the key to many unexpected and therefore doubly delightful bonuses. If you want some tips on how to use and evaluate your current binoculars, check our blog post on How to Use Binoculars. If you're thinking of getting binoculars but don't know what to look for or how to distinguish between different models, see our introduction to binoculars and guide to what's important at different price ranges in our article on How to Choose Binoculars. If you'd like to get an idea of what binoculars we carry in our store, see Our Binocular Selection. We have one of the best-stocked bino cases in the Bay Area, including models from Nikon, Swarovski, Vortex, Opticron, Zeiss, Celestron, and Vanguard.